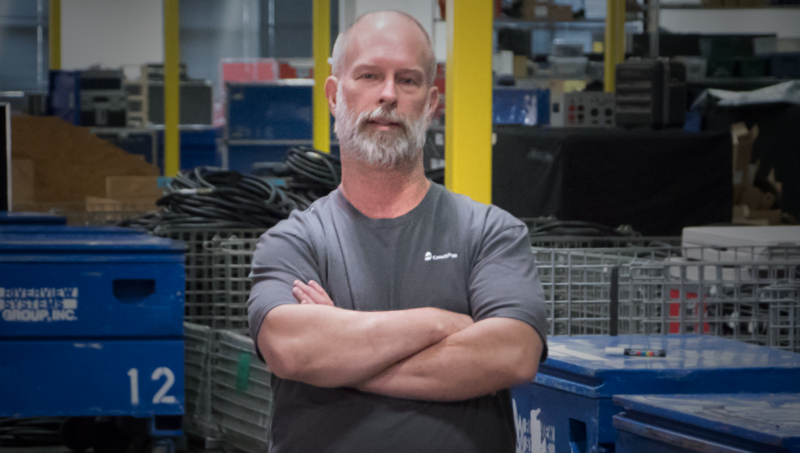 A Chat With John Hunter, Director Warehouse Operations | Riverview Systems Group, Inc. In 1995 Pixar’s first movie “Toy Story” opened in theaters, eBay went live, Christopher Reeve was paralyzed and the Grateful Dead played their last concert ever. It was also the same year a young John Hunter joined the then 8-year-old Riverview Systems Group’s video department. His tactical and organizational skills didn’t go unnoticed for long because in less than a year at Riverview he was promoted twice. It’s true, managing Riverview’s immense warehouse that houses the company’s technological life-blood is not a job for the faint of heart. The Riverview warehouse is 70,000 square foot, housing an array of gear ranging from traditional theatrical lighting fixtures to modern LED luminaires, audio systems, projectors, graphic switchers, screens, flat panel displays, scenic design elements and more. On call 24-7 unless he’s on vacation and/or out of state, Hunter’s responsibilities include facility maintenance, shipping and receiving, staffing local events, and coordinating logistics within the company’s various departments, including installation. John took a few minutes out of his day to share with us the challenges his job presents, his well-honed ability to adapt quickly to the ever-changing schedule and his love of video games. What were the early days like in the warehouse? JH: At our first location there were no loading docks, which required forklifting all of our audio, video, lighting and staging equipment into the trucks then hand- lifted into place. The process was slow and hard and, of course, if it was Tuesday or Friday we had to work around the local bingo hall we shared the parking lot with. Sometimes the folks would show up as early as 2 pm to get their favorite spot close to the door, which often impacted our operations. Riverview’s second location was more efficient because it had two docks, but we were only able to use one. The loading process was better, but still, with 8-9 trucks going out on any given day, the warehouse was a sea of boxes. When we had super crazy busy days you would have to walk on top of the boxes because there was no space on the floor of the warehouse. We moved to our current headquarters 5 and a half years ago and the warehouse now has 4 inbound docks and 4 out bound docks. This allows us to have equipment coming in while we load the outbound trucks. We also have double the amount of floor space. JH: By the end of the previous day I am already thinking about plan A, and a ‘what if’ plan B for the next day. I arrive at the office early to prep for our daily 8:00 am warehouse meeting where we go over safety issues or concerns of up coming shows and orders to be pulled. We’ll also talk about projects that need to start and give everyone a general idea what’s going on for the day and week ahead. After that, I usually do a lap around the office to ask the account managers questions about shows, or staffing or orders, and then check my email to see if anything needs immediate action. I also look over upcoming orders to make sure we have the right size trucks for the job or if I need to rent additional ones. From there I visit each department inside the warehouse: Shipping/Receiving, Video, Audio, Lighting, Projection, and Scenic, to follow up on the order being pulled and track progress and update my show/delivery whiteboard outside my office. I’ll also meet with my drivers and go over daily deliveries and pickups and oversee loading or unloading trucks. On truck loading days it is crucial that we balance the weight of the equipment in the truck properly. If the truck is unbalanced or overweight, it might come back and need to be unloaded and reloaded. So it is important to get it right the first time. As Warehouse Manager, keeping constant track of your inventory and the logistics involved with it sound daunting. What are some the challenges you face day-to-day? How do you deal with those challenges? JH: I spend a lot of time looking, watching and listening. At times I feel like the character Radar from the TV show “MASH” because having done this job for such a long time I’ve built up an intuition about potential issues. I’ve also developed the ability to adapt quickly to live event schedules that change frequently. I very rarely say “no that can’t happen.” I usually try to offer at least two solutions to work out any problematic situation. Do you recall a particular project or event that was especially challenging? JH: No particular project leaps to mind. Every day we’re shipping out as much 250,000 pounds of freight. Just making sure equipment gets into the right trucks so it can be delivered on the correct day and time is a challenge. We have a very detailed process for making sure we get it right involving color-coded labeling, staging lanes and order completion reports that I read closely, looking for gear that’s been mislabeled or misplaced. Maybe once every couple of years a piece gets on the wrong truck, but it’s never resulted in anything dramatic, usually, there is a workaround. Is there a tool/gadget/software/app, etc. you must have to do your job? JH: Not many in my world. I will tell you painted lines marking the size of the trucks we load — 16, 24,53 feet — on the warehouse outbound floor helps in making sure the orders will fit in the trucks. Also, shipping container scales are important for us to figure out how many trucks we need and help resolve the “too much gear and not enough truck” issue on the orders. JH: I love that I never really know what the day will bring. I can anticipate and have a Plan A and Plan B, but based on my years of experience every day is a new challenge. Whether it is extra deliveries or extra pickups, shifting resources when people are sick or vehicles in repair, or a job site or installation that needs extra servicing. No day is ever the same and I love it. Tell us something your co-workers might be surprised to know about you? JH: I just celebrated my 30th wedding anniversary. When I was 10 I lived in Holland for 2 years after my dad accepted a job there, so I got to travel all through Europe at a young age. I also love videogames – from my youth spent playing arcade games like Asteroids and Defender for hours on a single quarter, to Xbox games today like Battlefield. What do you for fun outside of work? JH: Besides video games, I love visiting craft breweries with my son, as well as spending time with my wife and our 2-year-old Anatolian/border collie mix rescue dog. What’s the last movie you loved, TV show you binged, last song you downloaded and/or last book you read?